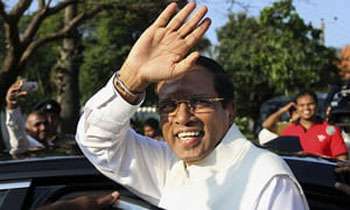 President Maithripala Sirisena today left for Singapore on a two-day state visit, President media division said. He is expected to deliver the Keynote address at the Third Forum of Ministers and Environment Authorities of Asia Pacific during his visit. Neva gilunath ban joon. Lankava sena dambaluwata baara deela anna yanawa lokka. Hari honda wedak. Why not come down under for a holiday? Can join hathuru. Speak in Tamil or Sinhala. oh yes PLEASE. Even Chinese would do. your english is far too good. A list of the delegation please. My hard working president. Next stop Buckingham Palace to see the queen. What a joke! Now, make use this opportunity to tell Singapore counterpart to extradite Arjuna Mahen and to cancel FTA with Singapore. IF you return without doing this, then you too are answerable. You should have declined the state visit due to SLFTA issues and AM evading arrest. wow! another tour. this has become a weekly event. who are with him this time ?? those uselesses ? Just returned from Philipines. In this rate we will soon see headlines, ‘President visits Sri Lanka’. Soon his return to Sri Lanka will be a news. 10 member delegation at tax payers expense? What is the agenda? Will he take up the free trade deal and the warrant issue on Singapore citizen former governor of the central bank evading arrest oris it a free trip/ho;iday? What is the press and society doing about this? What’s wrong with Sirisena? Roaming around the world with several of his stooges for no useful purpose. Don't humilate us further, please stay at home. His time is short so he should make the maximum visits abroad where he will never ever be able to visit again. Didn't he promise he won't be globe trotting like his predecessor? He hardly had time to unpack from his pleasure trip to the Philippines. What a waste of poor people's money! His excellency will come back with a law banning chewing gum as he is on world tour to learn best practices. Looks like he's making hay while the sun is still shining. Wont be shining for much longer anyway.. He's certainly making hay while the sun shines, isn't he? What a waste of time and money of hard working tax payers. Does he care? He is laughing at the poor. This Monkey really know how to spend poor LANKANS money!!!?? What a shameless and useless moron. Singapore enroute to Colombo from Phillippines!!! Why the monkey didn't make the Stopover!!?? Huh!! Wasting poor mans money for private activity.